Urgent Festival of Power update from SPR. Due to the recent bad weather, more rain forecast and muddy, waterlogged car parks, we regret to inform all non-ticket holders that we are now unable to offer any further tickets for sale for this weekend's Festival of Power. Further heavy rain is forecast in the next 24 hours and although Sunday's forecast is better, it is pretty clear that the venue car parks and camp sites are at their limit to accommodate further vehicles and traffic movement. Advance ticket holders are also advised not to attend and non-attendees will be offered a 100% credit value on their tickets to be used at a future event (see adverse weather ticket policy). Should you be in possession of an advance ticket and still choose to turn up, then please think very carefully about your decision especially if bringing children. You will need plenty of stoicism, patience, a suitable vehicle and wellies! The car parks are incredibly muddy and some areas are simply unusable so space is limited and not guaranteed. If you do decide to risk turning up, then only our normal adverse weather policy will apply which may be a lower credit or none at all depending on the track action. This decision has not been taken lightly and we know many of you will be incredibly disappointed but in the interests of your health, safety and enjoyment, then we feel this is our only option and to forewarn as early as possible. 30th March: At this time of year the UK's York Raceway would normally be getting ready to open its gates for the first event of an action-packed season of racing at The North's Drag Strip. This year however, things are a little different with TMD Friction now having an interest in the venue and moving towards development of their vehicle test track which will operate on the site with York Raceway. Negotiations during 2017 gave the opportunity to retain the current site on the former Melbourne Airfield as a permanent drag strip, the original proposal from TMD being that they would require sole use of the site. Pennine Raceway Ltd, the operator of York Raceway, were set a target by the landowner of raising £100,000 by 1st January 2018 in order to be able to make the significant investment which would be needed to allow drag racing to continue at the site alongside the TMD Friction facility. Pennine Raceway Ltd, Pennine Drag Racing Club and their racers, friends and corporate partners surpassed this total in December 2017. Pennine Raceway Ltd are currently holding all funds from corporate sponsorships and Pennine Drag Racing Club is holding all monies raised from personal donations. PDRC unanimously voted at their AGM to release funds, alongside the funding from Pennine Raceway Ltd, to the landowner in order to facilitate resurfacing works pertaining to York Raceway as and when they are required. Pennine Raceway Ltd, alongside its consultants and partners, have worked hard to meet the requirements of the landowner as they have arisen, but contract negotiations between the landowner and TMD Friction over-ran the original timetable. This has delayed both the required resurfacing works and the negotiation of the terms of the new ten-year lease which the landowner has offered for York Raceway. It is still hoped that resurfacing works for both the TMD Friction test track and York Raceway can take place simultaneously in order for all parties to benefit from cost savings but this cannot be guaranteed. With contractual negotiations between Pennine Raceway Ltd and the landowner ongoing and infrastructure still needing to be put in place York Raceway is not yet able to release its event calendar for 2018, but the team at Pennine Raceway Ltd are planning a series of events which will build on previous successes and to introduce new event formats which will sustain and strengthen the drag racing scene in the UK. 29th March: Many thanks to Santa Pod Racers Club Secretary Ian Marshall for sending us Version 2 of the official entry list for Big Bang, which takes place at Santa Pod Raceway on 28th-29th April and which is a Championship round for VW Pro, VW Sportsman, Outlaw Flat Four, Hutchinson & Dibley Sportsman ET, Lucas Oil Junior Dragster, 8.50 Bike (SPRC Championship), 9.50 Bike (SPRC Championship), ET Bike, Outlaw Anglia, Nostalgia Super Stock and the FWD Drag Series. You can check out the Big Bang entry list by clicking here or by clicking on the John Woolfe Racing Event Coverage link on the left-hand side of any Eurodragster.com page. Standard-rate entry closes next Friday, 6th April; entry after that date, if accepted, may be subject to a Late Entry penalty. You can fill in and submit or download the official Big Bang entry forms via the Information link of the SPRC web site at www.eurodragster.com/sprc. If you have any queries about Big Bang entry then please get in touch with Ian on 01933 313625 (outside the UK +44 1933 313625) or E-Mail ir.marshall@btconnect.com. 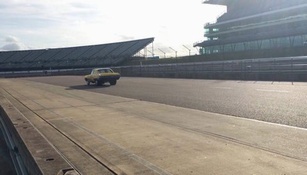 29th March: Gearhead Garage UK Super Pro ET racer Tom Atkinson says that the Time is Money Cortina will not appear at the front of the pairing lanes this weekend as the clutch of the team's trusty bus has given up the ghost. "After a bit of a rush about and an attempted master cylinder rebuild, the seals which arrived today just weren't quite right and our newest crew member split one of them trying to reassemble it, so we're going to replace the clutch with a Bruno Lenco", says Tom. "I'll still be heading up in the Toxico.uk Ranchero to tow the caravans round (some of the way at least) and to give Kirstie a hand with the 50 Shades of Racing Camaro in Sportsman ET. We would like to thank folks for the kind offers of tow vehicles and trailers, and wish everyone a safe and fast Festival of Power. See ya at the track!" The latest spy picture to arrive at the offices of Eurodragster.com (above right) came with the words "Hatched in the Nic of time". If you know more, or if you would like to send your own spy picture, then drop us a line at eurodragster.com@btinternet.com. Not long after the news of the possible demise of the drag strip at Alastaro comes much better news that the Finnish Hot Rod Association and their partners are constructing a new drag strip at the former military air base at Kauhava. The track will host its first races in August of this year and it is planned to host European Championship events there from 2019. You can read more, with judicious use of Google Translate if necessary, by clicking here. Llangollen Motorcycle Show organiser Peter Rogers is seeking a Top Fuel Bike for static display and, if possible, a couple of fire-ups at the Show which takes place on 4th-5th August. If you are interested then you can get in touch with Peter at progers.gse@live.co.uk. Sam Marston and the whole PMR team asked us to say a big Happy Birthday to racer and longtime Eurodragster.com News contributor and Blogger Paul Marston. Our pleasure Sam, have a great day Paul. Following on from gearbox damage to third gear at the end of the of the 2017 season - yes we're still manual! - a damaged TKO box was sourced, extensive research by Steve and numerous E-Mails and calls later we are now the proud owners of new sparkly Liberty gears and all the extras required to run a TKO box on our set-up. Our plan was a mini strip-down and freshen up of the engine and our chance to change to an electric water pump, coil on plugs and a few other bits and pieces. After finding damage to one piston this inevitably led to a full rebuild, which in turn led to... we've been toying with the idea of a new ECU for a while after repeated problems with overheating and a rather distinctive sound during the burnout courtesy of the rev limiter. So we finally bit the bullet and all of the original wiring has been removed. Cue a Mustang, meat and beer weekend in the North East. Our Crew Chief Barry Halliwell arrived with cake from the Hospitality Team, aka Sally Halliwell, our sponsor and fellow racer Dave Withington of GFX Power - find him on Facebook and Twitter! - arrived then they worked their black magic electrical wizardry and a new FAST system has been installed. It's a thing of beauty and we can't thank the lads enough. Cue the steep learning curve of how to operate and even start the Mustang! Work commitments, overspending and not enough time in the garage, along with a much needed sprinkle of John Sleath's magic, means that we'll not make the Festival of Power. We're aiming for the Main Event but even that's up for debate. It's a completely new set-up and we need time to adjust and get a handle on it, not to mention the track time required. 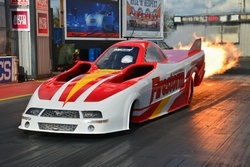 We'll be keeping up to date with the racing via the fab Eurodragster.com site (Thanks! - Ed) and we wish everyone all the best. Here's hoping that Super Street grows as a class... we'll be back as soon as we can! We've been lucky enough to pick up some new sponsors who are keen to support us and our team: Mammoet UK, specialists in heavy lifting, transport, and modular construction, and Metcalfe Farms who specialise in heavy haulage and truck repairs. On a side note it seems we can currently lay claim to the fastest blown 2v modular stick shift Mustang in the UK - not bad for a built not bought car. So it might be two months, it could be six months, maybe we'll have to wait for 2019. But don't forget us, we're still here and we'll be back ASAP! The dates are Saturdays 5th May, 22nd September and 20th October. The format will be the same as in 2017 with £10 in the pot from each entry with NAST adding £100 and trophies for winner and runner-up on the day. This is open to any motorcycle regardless of number of cylinders. However, points at each event for Twin-cylinder entries will be carried to the final where, in addition to trophies and additional cash for that day, there will be overall winner and runner-up trophies and an additional prize fund, for twin-cylinder bikes only, of £500 for the winner and £250 for the runner-up (current NAST member - £10 fee, unless you were a member in 2017 then your membership carries over into 2018). Overnight camping is available if you pre-book and arrive before 5:00 pm on the Friday and as all dates are Saturday Night Specials there is camping on Saturday night as well but you must make an early departure on Sunday unless you have a weekend ticket. More details and an entry form are available at www.supertwins.co.uk/supertwins-25th-anniversary-challenge-cup. 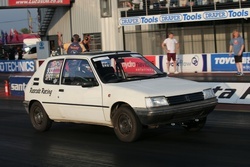 Many thanks to James Forster at Santa Pod Raceway. The art of avoiding Racepak questions. Most of the issues which people have these days are related to the older versions of Datalink II or the firmware in the datalogger. To make both of our lives easier in quickly finding any issues, please update your laptop / computer and also your datalogger with the latest software and firmware. Software is on your laptop or computer. 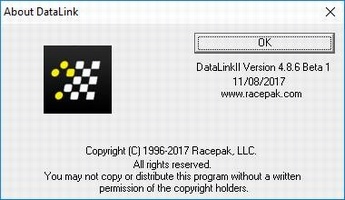 Datalink II vurrent version is 4.8.9. You can find your current version of Datalink II by clicking on the Help tab in Datalink II, About Datalink II. 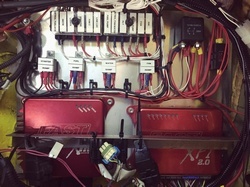 Firmware resides inside your Datalogger, PRO III (A), V300 (SD), V500 (SD), Sportsman, G2X (Pro) IQ3 Drag Dash / Logger Dash or IQ3 and UDX display-dash. 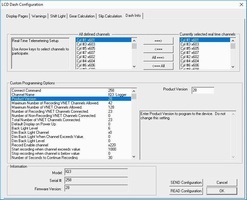 You can find you current firmware version by right-clicking on the datalogger channel when you have your configuration file open. 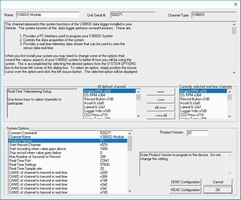 As well as new options in both software and firmware, it is also recommended that you update to get newly-installed V-Net modules to work properly. We keep developing for your racing pleasure. Both software and firmware updates are free to download at store.racepak.com/support/downloads. My first drag race visit of the year will take place at this week's Festival of Power at Santa Pod Raceway. As always you can put your name on the list in the Pro Dutch Pro Modified pit if you would like me to come to visit you. I will be bringing a lot of spare parts and complete systems such as the V300SD, IQ3 Drag Dash and Sportsman. If you would like any information or need help picking the right system for your application then I'll be glad to point you in the right direction. If you need me to bring any other parts such as engine bearings, blower belts (Clevite), tools, spark plugs, you name it and we probably have it. Please E-Mail your orders to dickkoster@post-en-dros.nl. 28th March: Stefani Fisher tells us that 2018 marks thirty years of Pro Mod racing for Eurodragster.com sponsor Andy Robinson. "To celebrate, we're posting photos, videos and memories from those thirty years on our Facebook page", says Stef. "There have been lots of successes and also challenges over the years and it's nice to look back and remember the various different events in our team's history. We're pretty much all set now for the Festival of Power which is Round 1 of the MSA Pro Mod Championship, hopefully we'll be able to pick up where we left off from the National Finals which was by far one of our best meetings. We look forward to seeing everyone there!" 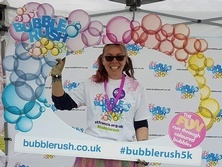 SPRC marshal Caroline Boncey is again taking part in a charity Bubble Rush to benefit the Hospice Of St Francis in Berkhamsted, where her late grandmother was cared for, and would be pleased if any Eurodragster.com sponsor could sponsor her for this good case. "The Bubble Rush is a 5 km walk / run in Gadebridge Park in Hemel Hempstead in 29th April", says Oscar. "They have four bubble stations - pink, blue, yellow and green - each of which we go through twice. The first year I looked like a smurf and the second year Oscar the Grouch. What colour this year? Every year I look forward to raising as much as I can to help the hospice which cared for my nan". You can find out more and donate on Oscar's Justgiving page at www.justgiving.com/fundraising/caroline-boncey3. We were pleased to hear from Remco Scheelings that our good buddy Pär Willén, aka PiPPi, is to take up the microphone and commentate at EDRS Pro Nordic Motorcycle Championship rounds. 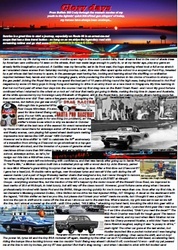 You can read more on the Drag Racing Europe Blog by clicking here. If you are joining us at Santa Pod Raceway this week then courtesy of Stephen Billings the good news is thst Hinwick Road (the road opposite the exit from the track) has now reopened after the bridge reconstruction. Unfortunately work commitments have got in the way, with my day job of supplying sound and lighting production to events clashing. I have managed to avoid this situation pretty well in the past, although it has been close a couple of times. But this one was unavoidable: the contract was signed in January, I was hoping it would be rescheduled as looked likely but alas it never happened. The event is for 2,000 people and is for a very old friend so it's a different kind of noise! Paul Marston Racing wish everyone the very best of luck at Easter, its the first time in twenty years that we won't be there. So we are looking forward even more to the FIA Main Event at which we will be out in force with at least three entries. More details of our 2018 driver line-up will follow shortly. Thanks again to Paul Foote Ink. 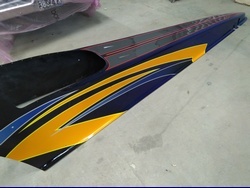 28th March: We are again very grateful indeed to longtime Eurodragster.com sponsor Paul Foote Ink for supplying the latest of several seasons' worth of Eurodragster.com decals. Paul, whom Eurodragster.com readers will recall for his striking Super Gas pick-up, produced decals in car and bike sizes and arranged for their delivery in a matter of days. Paul Foote Ink, whose web site you can find at www.paulfoote.com, supply corporate and bespoke sign management including complete design concepts, production and installation throughout the UK. Prestigious clients include Siemens, The Crystal London, Domino's Pizza and The Ace Café. Please show your appreciation for the support of Eurodragster.com sponsors by considering their companies when shopping for goods and services. Again a big Thank You to Paul. Festival of Power Perfect Awards. 23rd February: This week's Festival of Power at Santa Pod Raceway is the first event in the 2018 Eurodragster.com Perfect Awards Scheme. £100 will be on offer for perfect performance. Cath and Tig Napier of Bad Habit Racing are again kindly sponsoring the Eurodragster.com / Bad Habit Racing Perfect Light Award which commences at £50 this weekend. The money will be paid in cash to the first racer to record a Reaction Time of 0.000 seconds. The Perfect Light Award will be available to racers in all classes during qualifying and eliminations, but will only be awarded for the first Perfect Light of the event. If not won then the Award will be increased to £75 for Big Bang; if it is won then it will be reset to £50 for Big Bang. The Eurodragster.com / Gold RV Perfect ET Award is again kindly sponsored by Derek and Fiona Flynn of RV sales and service specialists Gold RV. The Award, which also commences at £50 this weekend, will be paid in cash to the first racer to run an ET to the thousandth of a second on dial-in or index. The Perfect ET Award is available in Gearhead Garage Super Pro ET, Modurstang Pro ET, Hutchinson & Dibley Sportsman ET, Super Comp, Terry Gibbs Super Gas Shootout, Super Street, Lucas Oil Junior Dragster (eliminations only), 8.50 Bike, 9.50 Bike, Junior Drag Bike, ET Bike, VW Pro, VW Sportsman and the Wild Bunch, but will only be awarded for the first Perfect ET of the event. If not won then the Award will be increased to £75 for Big Bang; if it is won then it will be reset to £50 for Big Bang. To be eligible to collect the Perfect ET Award, racers are required to carry decals, one on each side of the vehicle. If you pull an event's first Perfect ET but are not carrying decals then there will be no discussion; we will not pay out and the next person to pull a Perfect ET will get the money assuming that they are carrying decals. Please note that the decals have changed since last season; those from previous seasons will not be valid. Decals will be available in the Signing On office or from the Eurodragster.com office in Race Control (entry via Spectator Bank side stairs only). For more details about the services which Gold RV can provide please either see Derek Flynn in the Gearhead Garage UK Super Pro ET pits or visit www.goldrv.co.uk. If you have any queries then please contact your local Tech Inspector or get in touch with Ian at ir.marshall@btconnect.com or call 01933 313625 (outside the UK +44 1933 313625). 26th March: After the weather kiboshed a proper christening of Santa Pod Raceway's new concrete surface on last week's opening weekend, the track started to earn its keep for the second time of asking with a Run What You Brung on Saturday and a Peak Performance Day yesterday. On Saturday conditions were difficult whatever the track type but yesterday the new surface started to respond to the track crew's loving care and to the springlike weather. A number of PBs and impressive runs were reported, for example an 8.149 by 8.50 Bike racer Jay Roe, and Santa Pod Raceway's Two Seat Dragster, as ever in the hands of Steve Warner, equalled its best-ever sixty foot on its first half pass of the year and then was straight back into the sevens on the following full pass, the passenger being Santa Pod Raceway's Neale Saunders who was Project Manager for the track upgrade. 24th March: We would like to say a big Happy Birthday to Pro Modified colour commentator and Eurodragster.com News contributor Lucy Moore. Have a lovely day Lucy. 23rd March: Many thanks to Ian Marshall for forwarding us details of the arrangements for next week's Festival of Power at Santa Pod Raceway. Please note changes from the Final Instructions sent out to racers; car scrutineering now commences at 10:00 on Thursday, and Supertwin Top Gas' running orders have been amended. No race vehicle motors are to be fired up before 09:00 or after 20:00 on any day of the event including Thursday's Peak Performance Day. Before 09:00 vehicles should be pushed or towed to Scrutineering, not driven or ridden. Non-observation of curfew will result in exclusion from the event. Junior racers please remember the rule about pushing vehicles back to the pits once through the arch beside Scrutineering. At the request of SPR management the Eurodragster.com office at the Bankside end of Race Control is similarly out of bounds during racing except to Eurodragster.com staff, Zeon TV crew and racers or crew collecting Perfect Award money. 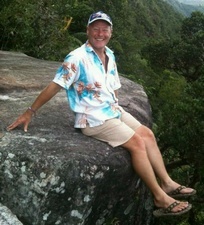 23rd March: Your News Editor would like to say a big Happy Birthday with hugs to his good friend Karen Brumby. Have a lovely day Karen. 22nd March: Many thanks to Santa Pod Racers Club Secretary Ian Marshall for sending us Version 1 of the official entry list for Big Bang, which takes place at Santa Pod Raceway on 28th-29th April and which is a Championship round for VW Pro, VW Sportsman, Outlaw Flat Four, Hutchinson & Dibley Sportsman ET, Lucas Oil Junior Dragster, 8.50 Bike (SPRC Championship), 9.50 Bike (SPRC Championship), ET Bike, Outlaw Anglia, Nostalgia Super Stock and the FWD Drag Series. You can check out the Big Bang entry list by clicking here or by clicking on the John Woolfe Racing Event Coverage link on the left-hand side of any Eurodragster.com page. Standard-rate entry closes on Friday 6th April; entry after that date, if accepted, may be subject to a Late Entry penalty. You can fill in and submit or download the official Big Bang entry forms via the Information link of the SPRC web site at www.eurodragster.com/sprc. No Prep Nationals 2 classes. 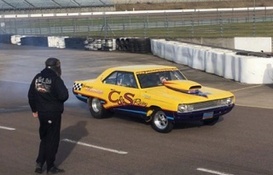 22nd March: Paul Marston has been in touch with racer and spectator details for the second No Prep Nationals, which takes place at Rockingham Drag Strip on Monday 7th May. No Prep Nationals 2: The feature class. Eighth-mile, no prep, no time, heads-up flashlight start. All run, anything goes, door cars only, two wheel drive only. Other than safety there are no restrictions on weight, engine size, power adders etc. Your car does not have to be street-legal, any tyre or slick permitted, grip juice permitted. The start line and finish line will be filmed. If you jump in eliminations you will be disqualified. A "jump" is defined as cracking the tyre or moving the car on its suspension before the light is on. We will be allowing call-outs for first round only. Same as at the North Weald No Prep Nationals last year all pairings other than call-outs will be drawn from a hat, including lane choice, up to the final. Also same as North Weald the entry list will not be published anywhere. You show up and find out who's in. The prize fund is £1000 cash to the winner, minimum sixteen cars. No Pre No Time Grudge / Call-out: This has never been done before in the UK, a class for people who want to run for money but who want to pick their own fight. The way it works is simple. Your entry fee includes Rockingham No Prep Dollars, wager money vouchers. All Grudge Racers will get a sticker to show that they are eligible for Grudge. You then walk around the pit, look at what's there and pick your own race. You negotiate your own wager with the other driver, providing he likes the match up. We will only entertain heads-up starts, no gapped starts like in Pinks. You line up in the Grudge staging lanes and when you come to the front the money is handed to the purse holder and you tell him what the deal is. Once the race is run and the winner confirmed the money is handed to the crew of the winning car. Again flashlight start and it's filmed so the same rules apply as No Prep. The cars do not have to be street-legal and you can run 4WD in No Prep Grudge. You can run as many races as you want for as much money as you want, no limits. The person who wins the most money will receive a trophy and at the end of racing all vouchers can be cashed in, with some people going home considerably richer! No Prep RWYB: If you just want to just come to RWYB and be part of it then please feel free to do so. Obviously we will run you as quickly as we can but priority will be given to the Grudge and No Prep Nationals racers. Pre-entry is available, or pay on the day. If you want to arrive on Sunday you must pre-enter, also you must include gate admission for everyone who is coming Sunday. For more details about classes, or for an entry form, please E-Mail pmdragracing@gmail.com, contact us through the Rockingham Dragstrip Facebook page, or call me on 07831 650230. Our track is the pit road, which is laid with a tarmac with the priority on traction. The racing distance is an eighth-mile, with an eighth-mile of shutdown area which leads on to main oval, so there is plenty of room to slow down safely. 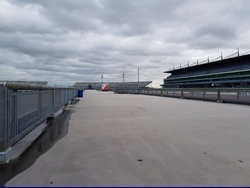 There is an excellent viewing area for spectators on the roof of the pit garages. 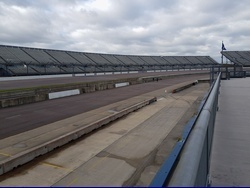 It runs the full length of the track and is purpose-built as a VIP viewing area for major circuit race events. At the No Prep Nationals access to the spectator area is free and access from the pit area to the viewing area is quick and simple via staircases. 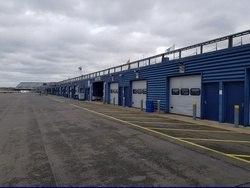 Rockingham Motor Speedway is a major facility and the Rockingham management have had to move stuff around to accommodate us, for which we are grateful. There are two other motorsport activities happening on the same day as ours; the National Circuit will be hosting a track day and the Drift Arena will also be operational. Neither will affect our operation, as we are completely self contained. 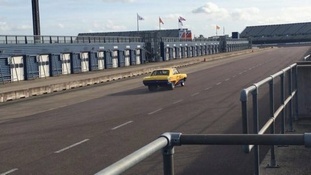 Your spectator admission ticket, £10 in advance from Rockingham's web site or £12 on the day, will allow you access to the other motorsport activities as well as to the drag strip. This is our first event, we are guests, so can competitors and spectators please be respectful and courteous to the Rockingham staff and marshals as we would like to come back. The postcode for your satnav is NN17 5AF. Firestorm has been in the workshop over the winter and is now ready to go. We had a mixed 2017. Following successful testing the previous year we had a really shaky start but with sheer determination, hard work and lots of testing we were confident to head off to Germany for the NitrOlympx at Hockenheim. With that under our belt we also attended the Hot Rod Drags at Shakespeare County Raceway, the National Hot Rod Reunion and the UK Northern Finals at York Dragway and the Flame and Thunder at Santa Pod. All a great end to what at times had been a very trying 2017 season – to put it mildly. So, on with 2018. We recently carried out the initial start-up away from the track. It went well, so we are now packing to head to Santa Pod for this weekend's testing to be ready for the Festival of Power. We are excited about that. So far the ETs have been respectable but as always we will work on increasing the speeds in small increments. We are still working with what is a new car and new systems. Settings are totally different from the old car, so there is much work to do there. We also have a brand new body in the form of a Ford Mustang rather than our old favourite of a Pontiac Firebird. The new body is fitted with a totally different inlet system which is proving to be very beneficial not only to the breathing of the motor but also to the aerodynamics. We haven't yet managed to go the whole hog and replace our Firestorm T-Shirts, which always went down well with fans, but we have at least invested in new Firestorm posters with a fantastic picture courtesy of Tog (You are very welcome - Ed). We also have new hero cards, which some of you may have seen in the latter part of last year. A massive thank you to artist Anth Knight of D73 Creative for his contribution in designing our new hero cards and creating the necessary artwork for it all to go to print. Let's hope that the weather gods are kind to us for the coming weekends and we look forward to seeing you all at the track. Please make sure you drop by and say Hello! After having an off season in 2017 due to a planned house move - which still hasn't happened - we are eager to get back to the track and race alongside the great bunch of guys and girls of Sportsman ET. 2016 was our début in competition and although we only competed in three events - the Festivl of Power, Big Bang and Bug Jam - we really enjoyed it. It didn't start off well as the Festival of Power was rained off after just a few qualifying runs. Big Bang was an improvement as we had some good qualifying but unfortunately I got knocked out in the first round by Andy Dibley - can't complain, he went on to win the Championship for two years. Bug Jam was a really good event for us. Nice hot weather, our team enjoyed the event and all it had to offer. We had some good qualifying and even managed to get to round two in our third event, which I never imagined. After all we are racing a French car with a French engine in a sport which requires consistency. But hey, we like to be different. The car will be virtually unchanged since its last outing other than some minor updates . I would like to say a big Thank You to my team of Rascals: wife Kellie and sons / Crew Chief duo Fletcher and Connor (aged 3 and 2). News and updates can be found on our Facebook page. 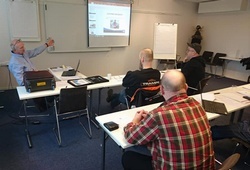 22nd March: Pedder Eneroth of the FIM Europe Drag Racing Commission tells us that the recent seminar hosted by SVEMO and presented by Palle Lind and Job Heezen attracted race officials from Sweden, Norway, Finland, Iceland and Lithuania. "During the presentation we realised that there was a total of over three hundred years of drag race experience in the room! ", says Pedder. "With that amount of experience in the room there was a lot of interesting discussion. After the seminar we had thirteen Clerks of the Course and five Technical Stewards. Now we hope that these Clerks and Stewards will soon be able to use their newly-acquired knowledge for FIM European Championship rounds in the Nordic zone." 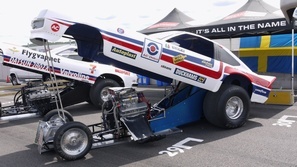 Eurodragster.com will be at Santa Pod Raceway to cover this Saturday's pre-Festival of Power Run What You Brung and Sunday's Peak Performance Day in association with John Woolfe Racing. The current plan is for a gallery at the end of each day; Webster Race Engineering / Nimbus Motorsport webcast is not currently confirmed but should it take place then it will initially be on test with all which that implies. Now is the perfect time to look to the future and whatever our goals may be. Growing up at Santa Pod has given me such an insight into the uniqueness of the sport we all know and love. However the time came, as it inevitably does, for Dad to sell up. It's never an easy decision to give up something which brought so much joy to us and it would be such a shame to see the car sit and collect dust when I'm sure there are many people out there who would do it justice. That being said, it's now getting to the point where we will begin breaking up the car and selling off parts individually. So, if anybody has any interest in the car as a whole then please get in touch via the contact details on the Swap Meet advertisement. We will offer as much support as we can; we want this car to continue being raced and be enjoyed by someone else. Even if you feel unsure please do get in touch and we will help you with any questions or concerns you may have even if you then decide it's not for you. I'm very much looking forward to this season and hope to be at the track as much as possible to continue being involved in the sport as much as I can. I hope to be at the Festival of Power at some point so if anyone has any questions or would like more information on the car then please find me! Good luck to every team for the season. I can't wait to see what the Pro Mod boys can pull out of the bag this year! You can find the Moore Brothers' Pro Mod in the Cars For Sale section of our Jeff Bull Race Engines-sponsored Swap Meet. 22nd March: In the latest entry in his exclusive Racer Blog, Luke Bennett brings us up-to-date on work to get the team's blown-alcohol cars back on track despite various problems not of the team's making. You can check it out by clicking here or by clicking on the Racer Blogs link on the left-hand side of any Eurodragster.com page. Our good buddy Steve Moxley has had his Bonneville Speed Week report and pictures posted on the Eat My Ink web site. You can take a look at www.eatmyink.com. SFI 3.2A/10 and higher suit recertification. The SFI Spec for driver suits states that all jackets and pants or driver suits which meet SFI Spec 3.2A/10 or higher must be recertified at a five-year interval. Suits with these higher ratings have SFI patches which indicate the year of manufacture. For recertification, owners of driver suits should contact the original manufacturer to find out their procedures for returning the suits for inspection and recertification. 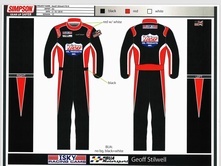 On driver suits with sewn-in arm restraints, the date stamped on the arm restraints is a reference date for the manufacturer and has no bearing on the suit's expiration date. For further questions on the requirements contact either the manufacturer of your driver suit, the SFI Foundation, or send me an E-Mail at dragracingtech@eircom.net. Far from Grumpy with Rockingham. The temporary drag strip is eighth mile, as opposed to the more traditional quarter mile standard here in the UK. However in the United States this distance is very common. We went to put in some test hits on this new surface, just to christen it, to see what the grip level was and how the driving experience felt. 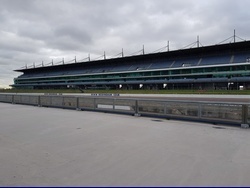 Prior to our runs, the Rockingham track crew very kindly ran the sweeper down the track to ensure that it was clear from small stones or debris, although it was hardly needed as Rockingham is immaculately maintained. But we were very grateful for the attention to detail. 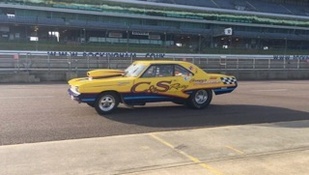 The weapon used was Grumpy's Dodge; she runs 9.50/135 over the quarter and is a traditional Super Gasser which we felt would give is a representative example of the available grip and handling. The track temperature just about made fifty degrees. We put two hits on the track. The first run was a burnout across the start line and full pass to the eighth. The second run was a burnout across the start line, back up, use some grip juice for a second burnout, and another full pass. Both of these were with a flashlight start which we will be using at the No Prep Nationals. Testing went well. The track took some rubber quite nicely and the grip level was not bad at all, taking into account that these were the first ever hits made on the track by a drag racer. From the driver's perspective Grumpy was planted, not skating around, and the shutdown area presented no problems other than becoming familiar with different surroundings. 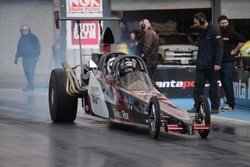 Santa Pod opens with £1000 for charity. 18th March: The ceremonial first run on Santa Pod Raceway's new concrete track took place at the Run What You Brung yesterday (Saturday), as a result of which Magpas Air Ambulance and The Air Ambulance Service were each £500 better off after the chance to make the first pass was posted for auction on E-Bay. 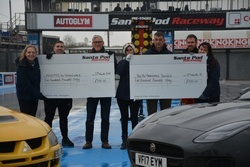 After a presentation ceremony Jordan Bradford and Neale Saunders, who was Project Manager for Santa Pod's track upgrade, took the first run gently in cold and windy conditions, Neale in a Jaguar loaned by stunt driver Terry Grant. Both Jordan and Neale came back later for a higher-throttle pairing when the brief and frequently weather-interrupted RWYB commenced. In association with John Woolfe Racing we have posted a small gallery of pictures of the presentation ceremony, the first run, and the RWYB. A big Thank You to off-track photographer Diana Macrae for braving the snow and gale. You can check out the RWYB gallery by clicking here or by clicking on the John Woolfe Racing Event Coverage link on the left-hand side of any Eurodragster.com page. 18th March: We were sorry to hear from Geoff Stilwell of the death at 78 of legendary Funny Car and Fuel Altered pilot and Crew Chief Dale Emery (right, picture below left). 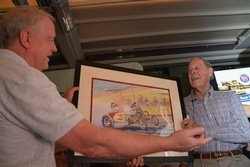 Dale is remembered in the UK for driving the Chadderton and Okazaki Funny Car, which became Gladiator, at Santa Pod Raceway in the mid-1970s but we were also lucky enough to see Dale as recently as last November when he attended British Drag Racing Hall of Fame Bench Race, at which it was a privilege to speak to the modest and unassuming legend. Our deepest sympathies to Dale's family and friends. You can read the superb Dragster Insider account of Dale's career on NHRA.com. The latest spy picture to arrive at the offices of Eurodragster.com (above right) came with the words "No more words needed, lol!". If you know more, or if you would like to send your own spy picture, then drop us a line at eurodragster.com@btinternet.com. We would like to say a big Happy Birthday to our good buddy, former Track Announcer and all-round good egg (Apart from the country music thing, of course - Ed) Barry Bohannon. Have a great day Barry. 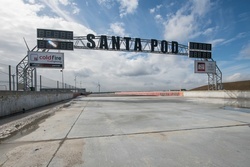 Santa Pod Raceway completes the new track! Many of you will have been following the exciting progress of works around the build of our brand new state-of-the-art concrete quarter mile track over the winter months and this has now finally been completed. This project was started back in August 2017 with the design and planning, followed by construction commencing in early November. I must add that so far, 2018 has certainly been both eventful and full on for many of the staff at Santa Pod Raceway given the weather in that period. With the time-line and schedule we had programmed to complete all the works and construction, to be frank it really became squeaky bum time with Easter looming, a major event on the horizon and the weather preventing the concrete being laid. Most, if not all, of the staff at Santa Pod Raceway are used to working under pressure most of the time and we all mange to take that pressure in our stride, week in week out, but the recent stress of facing an unfinished race track by Easter sent the barometer up and way above even our normal levels. The design and planning of the reconstruction of the old asphalt track began in early August 2017. This was followed by the awarding of the contract to relay the whole quarter mile race track in concrete to Knights Construction, based in Wales. 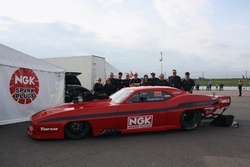 Soon after, fact finding and technical information gathering trips were made to NHRA tracks in the USA by Matt Jones, MD of Knights Construction and Neale Saunders, TBR (Trakbak Racing Ltd) project manager. 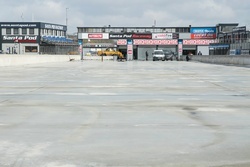 After much discussion with various NHRA track personnel the final design for the new track at Santa Pod was complete. Track works began after the Flame and Thunder event at the end of last season. It was soon discovered the ground works required was going to be a far bigger job than at first estimated and budgeted for. We had to undertake a far greater amount of ground works, drainage works and preparation of the ground ready to be able to take the very high level and density of concrete we were planning to lay. With most of the ground works complete, we were ready to start to pour concrete by late November (2017) – then the major enemy of Santa Pod, struck again – the weather! Due to a combination of rain, snow, cold air temperature and high winds we were unable to lay any concrete until late February; way, way past our deadline for completion of the concrete laying. By some small miracle, we had a 3-5 day window in very late February and early March when the weather allowed us to pour and lay the concrete track in the 5 sections needed. The job went 90% to plan and we had our new concrete track ready for track crews to prepare ready for racing. If that all sounds all quite straightforward, all I can add is that the whole project was anything but straightforward. With that said, we now have a new, laser-laid, all-concrete track the full length of the quarter mile with such smoothness and levels that we have not had previously, despite having had the fastest asphalt track in the world. Where we go from here and how fast this new concrete track becomes in the future is a very exciting prospect indeed. Although potentially, we now have a very fast race track indeed, I must add a note of caution to everyone; it is going to take a few months for the race teams to dial into this new concrete track and indeed for our own track crews to learn the dynamics of how to achieve the best preparation for the best results – meaning fast times across all classes. We have prepared and worked on concrete tracks before at the other events we run across Europe but each track is different. Also, remember that the drivers, riders and teams only have read-outs and graphs of how their race cars and bikes have performed on the old asphalt track. However, I am optimistic that by the FIA/FIM Main Event (May) some of the teams will have a handle on it and, given the right weather conditions, good times and speeds will follow. If I am right, then by the European Finals, I am hoping to see European records fall to Santa Pod once more – that is our goal to produce a European record-holding track. It is not only the race track that has undergone a full refurbishment. During that same project, we've also undertaken a full refurbishment of the spectator grass bank. This has involved a complete re-shaping and profiling of the bank along with a much wider path on the top with better, improved access from the rear of the bank. Oh, and easier access to the hill top bar for those who like a little liquid refreshment during the racing! The bank like the track was laser levelled and it is a pleasure to, at last, see an even bank running the entire length. Typically, things didn't go to plan and the same issues affecting the track have also impacted on the completion of the bank – the weather AGAIN! The "Beast from the East" took its toll. We have been unable to get the new grass seed to germinate in time for Easter due to the weather being too cold. To try everything possible we had even invested tens of thousands more in a special type of grass seed and application that would germinate in colder conditions – but alas not that cold and for once too dry. Who would think we would be saying at Santa Pod the weather has been too dry! This has meant putting into place Plan B for the Festival of Power event with temporary ground cover and free arrangements for sections of the grandstand. I would like to thank everyone for their incredible patience, support and understanding in this particular matter. 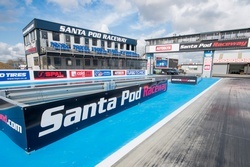 Please see the Santa Pod web site for further information on those particular arrangements. 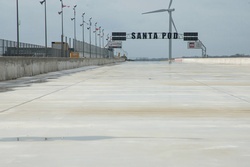 In closing, Santa Pod has invested nearly £1,000,000 this winter in the new track and bank projects and we are all hopeful that this will become another big leap forward in Santa Pod's ever-improving facility. When I look back to 1996 when I purchased Santa Pod we have come a long way – but I'm nowhere near satisfied we are there yet – in fact not by a long way! 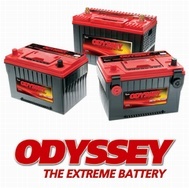 Harry would firstly like like to say a very big Thank You to our sponsors at Odyssey Battery for supporting us for the third year running. Harry was very lucky to get Odyssey Battery as a sponsor when he started racing and we cannot thank them enough for all their support. Harry has had a amazing two years in the sport and has loved every minute of it. Last year we competed in the Association Trophée Dragster at Clastres in France at clastres and we had such an amazing time. Harry managed to win the Championship, we couldn't believe it as it was only our second year. It was such a amazing time and we met some amazing people. We are going to compete in the ATD again this year so we start the season at Rivanazzano in Italy then we have two meetings at Clastres and the Finals are at Vichy. We are looking forward to the UK season starting and we are really looking forward to racing on the new track at Santa Pod, it is looking amazing. I will be starting my racing career in Pro ET, I have watched Harry racing and every time I am on the track with him I just want to race myself. So last year we acquired the old Mark Richardson Pony Express altered. Our very good friends the Ford family spent last year updating the altered for us, without all their help we could not we could not have had the car ready for this season. We will be running the altered with a Fiat Topolino body shell and under the name The Joker Express. 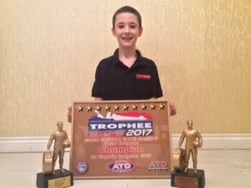 We are so looking forward to racing in both Junior Dragster and Pro ET this year. Our sponsors at Odyssey Battery are so happy with our progress that they are also supporting me in Pro ET, and we have been very lucky to have some new sponsors too: we are also being supported by Teng Tools and DFDS Ferries. Without the support of our sponsors we could never do what we do. With the extra car we are also bringing in a new crew member, my nephew Mark Hamilton be joining the team. It is his first time around drag racing and he is so looking so forward to it. Harry and I would like to say a very big Thank You to dad Brian Redshaw for being Crew Chief on both cars. Grandad Brian will be running Harry then running back around to run me so he is going to have a very busy year too. 16th March: If you are joining us at Santa Pod Raceway tomorrow for their first RWYB of the season then courtesy of Stephen Billings we can warn you that Hinwick Road (the road opposite the exit from the track) is closed due to bridge reconstruction (map). Alternative routes are available off the A6 via Wymington or off the A509 via Bozeat / Hinwick. We would like to wish a big Happy Birthday to our good friend and Honorary Eurodragster.com Staff Member John Hackney. Have a great day Hackers. SPAL Automotive join Doorslammers fun. 15th March: SPAL Automotive is expanding its relationship with Santa Pod Raceway in 2018 with the sponsorship of the Front Wheel Drive class of the Doorslammers on 19th-20th May. Andy Saracino-Clift, Aftermarket Business Development Manager for Spal, said "We're delighted to support the event and no doubt in such high-paced conditions, those vehicles will have to be packing some high performance cooling fans from SPAL. In fact we've already had a Thank You for sponsoring the event from one of the competitors who has installed a SPAL fan as a gesture of support! Good luck to all the racers!" 15th March: The latest spy picture to arrive at the offices of Eurodragster.com came with the words "Crate expectations". If you know more, or if you would like to send your own spy picture, then drop us a line at eurodragster.com@btinternet.com. The FIA Commission have made some adjustments to the Technical Regulations to lower costs in Pro Modified and Pro Stock. In Pro Modified we corrected a mistake in Section 1.1 regarding Electronic Fuel Injection. In Pro Stock we have changed Sections 1.2 Cylinder Heads and 1.3 Engine. The rules have now been opened up so that a Pro Stock vehicle can use engines from other manufactures. For example, teams can use a GM or Ford engine in a Chrysler vehicle or vice versa. This was a rule which we had in the 1990s before we started to follow the FIA international drag racing rules. The rules were approved at the FIA World Motorsport Council meeting in Geneva on 9th March, which I attended to represent drag racing and to present and explain the changes. The 2018 Sporting Regulations for 2018 have also been released and there are some rule changes and costs reductions for organisers which we hope will help the FIA Championships to advance in future. There has been a lot of hard work by FIA officials working at events and by individuals who have sent in suggestions. I have to thank everybody for a good job. You can check out the 2018 FIA rules at www.fia.com/regulation/category/101. Janne has a whole workshop full of cars, parts and historic drag racing memorabilia from all over the world and we're delighted to welcome him with some of his display to Santa Pod for the first time. Janne's vehicles won't be running on track, but instead populating the show marquee with the Björn Andersson Manta and Lee Anders Hasselström Datsun being fired up to cackle throughout the weekend, including participation in the Cacklefest. 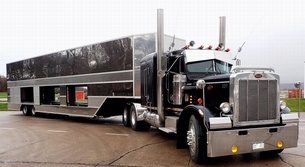 The Peterbilt, Ramp Truck and transporter are all show pieces themselves with everything being custom made to transport Janne's collection around Sweden and beyond. These will be in pride of place next to the display too. 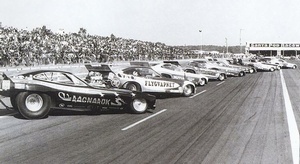 Whilst Janne's cars are here, we're also going to take the opportunity to combine his cars with the current crop of European Nostalgia Funny Cars in a bid to recreate this iconic photo of the line-up on the Friday evening. Who knows, we may even be able to line up even more floppers than we did in the original photo. Don't miss out on this opportunity to get up close and personal with some meticulously-restored Funny Cars from yesteryear. We'll see you there. TF and PSB roped together. 14th March: Thanks to Remco Scheelings for passing on the news that longtime friends and business partners, UK Top Fuel Dragster racer Liam Jones and UK Pro Stock Bike racer Alex Hope, have joined forces to form Team Asylum with sponsorship under the colours of their company CBD Asylum. "CBD Asylum manufactures and supplies CBD products derived from hemp from around the world and is continuously developing exciting ways to administer CBD", says Liam. "We are at the forefront of CBD innovation in Europe, having the only fitness industry aimed CBD products in Europe and sponsoring athletes such as professional cage fighter Alex Montagnani and the World's Strongest Man, Eddie 'The Beast' Hall. "Alex and I will be doing the full European tour again. It's going to be a really exciting year and we are expecting good things. I'm not going to tempt fate by predicting figures and standings, but it should be good! SFI Tour stops at Santa Pod. SFI Foundation Vice President Jennifer Faye was in charge of administering the recertification process. She was joined on each leg of the tour by Eurodragster.com sponsor Andy Robinson who was inspecting transmission shields, bellhousings and flexplates, Luke Robinson looking at clutches and L-G Eriksson of ME Racing Services in Borlänge, Sweden who was in charge of inspecting wheels. The parts under inspection all have specific SFI safety specifications according to the class of vehicle. Also attending were Geoff Martin, Mark Norton and Tim Read of the UK Tech Team who will also be able to certify chassis to SFI specs during the year. 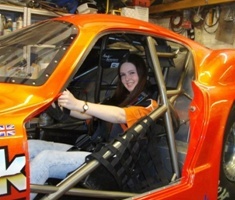 Jennifer reported that the numbers of parts inspected are up on last year and that there is a trend, as well as for new cars, for racers who have had a break from racing for several years to come back to the sport and consequently needing to upgrade their equipment to current standards. In Sweden 174 parts were inspected, in Finland 41 parts, and in Holland 64 parts. During our visit, more than 50 parts had been inspected by lunchtime, with last year's total of 75 likely to be exceeded; in the UK more racers are getting SFI certification in order to be able to enter MSA permit events. Fuel Funny Car racer Kevin Chapman will bring out the former Showtime car acquired from Bob Jarrett after licencing in a Top Fuel Dragster in September. Kevin said "We are having to make a few upgrades to keep up to date. I will be making a licencing half pass on Good Friday which will be my first hit in the car". Kevin will be crewed by former FC racer John Spuffard and he said that the rest of his crew had been recruited, with only one position vacant. Nostalgia Fuel Altered and Pro Mod racer Nick Davies is preparing the ex-Robert Koper Pontiac Firebird Pro Mod for a début later in the year. Nick said "With other projects on the go, we haven't been able to move the Pro Mod along as much as we wanted. 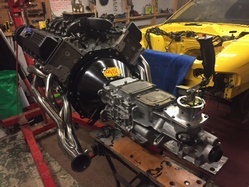 It previously had nitrous Big Block Chevy power and we will be using a turbo Hemi engine, however the transmission will remain a Lenco clutch". 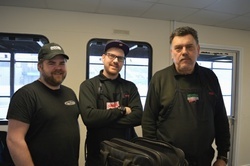 Other projects keeping Nick and Rob Loaring of ICE Automotive busy include refurbishment of Andy Bond's Street Eliminator Chevy, David James' planned Pro Mod car and work on the Street Eliminator cars of Nick Hales and Jeff Meads. Top Methanol Funny Car / Altered team Steph and Dave Milam were having transmission components checked, although the car in Altered format has been put up for sale (see Jeff Bull Swap Meet). Dave said "My eye has recovered from a problem last September but I am now waiting for a replacement for an arthritic hip. The car may be out later in the year as an Altered to maintain interest in it. We may split it if there is demand for the running gear or the chassis separately, and the engine still has the PSI blower on it". Once the car is sold, Dave and Steph will still maintain involvement in the sport by crewing. James Willaday is planning to run his rotary-engined turbo Mazda RX8 in Comp Eliminator and will also race at the Doorslammers. James said "It has a Hauser tube chassis, an engine I built, and tuning help will come from racers in Puerto Rico where rotary-engined drag cars are huge". James has worked with the engines for thirteen years and had a street car which ran 8.8. The new car, which is for the track only, features a Liberty trans, 91 mm single Pro Mod-style turbo and a Microtech ECU which can be set up remotely. He is discussing with race officials which class he can enter, and points out that the effective capacity of the 1308 cc engine for racing is still only 2616 cc. 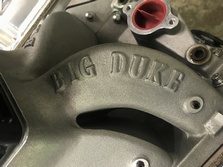 Wild Bunch racer Mick Gleadow was at getting his Jurassic Parts II dragster's bellhousing, flexplate and trans shield certified to enable him to run at MSA permit events this year. Mick said "I raced at an MSA event in 2014 and was runner up at the 2017 UK National Finals. Competing at MSA events increases the race meetings available for Wild Bunch teams to compete in. The Festival of Power has a field of six cars, more than last year". Mick aims to run an eight in the dragster, which is modelled on a Junior Fuel car, "Even if it involves nitro". Nostalgia Funny Car racer Rob Elsom suffered major mechanical damage at a VW meeting where two rods let go. He admitted "It wasn't the best year as I couldn't get further than two hundred feet down the track, and I haven't completed licencing". On the brighter side, Rob's new engine fired up successfully for the first time last Sunday and he is planning on running six events this year, with the Festival of Power coming first. He said it was tune-up problems that contributed to the lack of performance. "We were chipping away at it, but it was falling flat on its face early in the run, once the RPMs drop the fuel volume is wrong and there is more risk of a dropped cylinder and breakage." 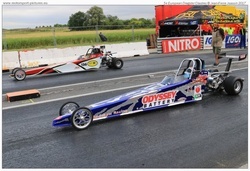 Super Pro ET racer Aaron Fensome, who bought the ex-Gold RV blown-alcohol dragster with sister Saskia Fensome Jell, will bring the car out for his final licencing pass at the test day before the Main Event. Aaron thanks Derek Flynn of Eurodragster.com sponsor Gold RV and Pete Walters of Eurodragster.com sponsor Peter Walters Race Design who, after an upgrade to a Big Block Chevy, will be working with Aaron on his similarly-powered car. Super Comp and Super Pro ET racer Nicky Frost will be returning from a year off with a new chassis under the car, built by Eurodragster.com sponsor Chris Isaacs and featuring a four-link suspension replacing the previous ladder bars. The engine will be a Steve Schmidt 584 ci with twin carburettors. The car will be back on track at the Main Event. Wayne Allman of the Intergalactic Custom Shop, running the Mental Breakdown VW pick-up, missed a part of the 2017 season following damage caused by the tip of a valve coming off at 1000 feet into a run, taking out a lot of his engine. After Wayne rebuilt he came back at the Hot Rod Drags and ran an early-shut-off 7.20. Wayne said "The car is legal to run MSA events and my target this year is to run a six at over two hundred miles per hour". Wayne is also working on improvements to Phil 'Ginner' Middleton's Outlaw Anglia Fordson, and a new Fordson build for a yet-to-be-identified racer. L-G Eriksson of ME Racing Services has been working on updates to Top Fuel Dragsters for the FIA series, and on rally cars. The amount of Docol tubing being used for construction doubled in 2017 and the tubing features on Pro Mod racer Mats Eriksson's rebuilt Green Goblin Crown Victoria, which is scheduled for a mid-season Scandinavian return. In association with Lucas Oil Products we are pleased to present a gallery of the SFI inspections, which you can check out by clicking here or by clicking on the Features, Interviews, Tributes link on the left-hand side of any Eurodragster.com page. 13th March: Many thanks to Santa Pod Racers Club Secretary Ian Marshall for sending us the "Final, final" version of the official entry list for the Festival of Power, which takes place at Santa Pod Raceway on 30th March-1st April. You can check out the Festival of Power entry list by clicking here or by clicking on the John Woolfe Racing Event Coverage link on the left-hand side of any Eurodragster.com page. If you have any queries about Festival of Power entry then please get in touch with Ian on 01933 313625 (outside the UK +44 1933 313625) or E-Mail ir.marshall@btconnect.com. OCS Group back The Doorslammers. 12th March: Santa Pod Raceway are delighted to announce yet another class sponsor for their new Doorslammers event in May. OCS Group have confirmed their position as title sponsor of the Big Bracket class. Said Nic Williams of the OCS Group "This is the perfect event for us to showcase our products and services so it makes perfect sense for the OCS Group to be the title sponsor of the Big Bracket, especially as so many of our customers that have had mechanical or paintwork with us will be competing in the class. Our new Northamptonshire based premises offers a one-stop facility for all of your needs from minor paint repairs to full bare metal restorations with OCS Paint, then next door the Williams Bros Racing workshops offers everything from routine American car servicing and parts to full builds, specialising in hot rods and NHRA Stock-legal race cars. We will be fielding at least three cars under the Williams Bros Racing banner ourselves and look forward to pairing up with cars from other classes that we do not normally race against. The whole team from OCS Paint, Williams Bros Racing, WBR Engine Dyno and WBR Speed Shop will be on hand to answer any questions you may have, we look forward to seeing you there." OCS Group join other class sponsors VP Racing Fuels, Turbo Technics, Spal Automotive, Lucas Oil, Webster Race Engineering and EBC Brakes to complete the line-up of class sponsors for the event which takes place on 19th-20th May. 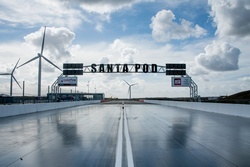 For more information on the event, the latest entry list, and to book tickets, visit www.santapod.co.uk/doorslammers.php. With the Land Speed race season fast approaching, on 18th-19th May at El Mirage just north of Los Angeles, the BUA Motorsport Team of myself, Bill Schultz, Sparky Perry (tuner and Top Alcohol Funny Car racer), Bob and Sharon Muravez, Carl Olson and a few others whom I will name later have all been very busy. Since the car arrived in Los Angeles we have got the fuel system, mag, blower, cylinder heads and fire bottles out for servicing. In addition we needed to make some upgrades because of rule changes regarding the seat harness. We have taken delivery of a Valesco crank, new Crower rods and Venolia pistons, Iskenderian Cams have supplied a new cam, lifters and cam kit with valve springs. On order are new oil lines, blower belts, valves and a few other bits and pieces. Bill Schultz and Sparky Perry will be putting the motor together shortly so that we can get it on a dyno and make sure that everything works as it should. Let me stress that putting something together like this to go for a new Land Speed Record in its class is no mean feat. 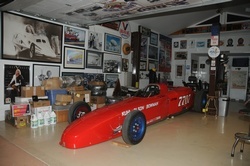 It takes up so much time and I need to thank those already mentioned plus Doug Stringer owner of the Parts Plus and Great Clips Top Fuel Dragster Team and driver Clay Millican, Ed "The Ace" McCulloch, Ed Iskenderian, Waterbed Fred Miller, Peter Muravez, Fast Eddie from the LA based Road Kings Car Club and the Legendary Tommy Ivo for all their help and support, and not forgetting Allen Bridges of Simpson for supplying my new firesuit and helmet. None of this would be possible without the help of Les Downey and Tom Bogner of Lucas Oil and the Camfather himself Ed Iskenderian. We are targeting El Mirage to make some gentle passes and get used to the car. Further updates to follow and our new Facebook page will be launched very shortly where you can follow our progress, plus we will be doing live broadcasts at the events connections and internet permitting. 12th March: Many thanks to Mike Collins for sending us a preview of his column in the latest issue of Street Machine magazine, available if you are quick, plus for Nostalgia fans a Glory Days exclusive for Eurodragster.com readers. UK Top Methanol FC and blown-alcohol altered racer Steph Milam tells us that the She Devil Racing race car is for sale in its altered guise. More details under Cars For Sale on our Jeff Bull Race Engines-sponsored Swap Meet. 10th March: Many thanks to Santa Pod Racers Club Secretary Ian Marshall for sending us the final version of the official entry list for the Festival of Power, which takes place at Santa Pod Raceway on 30th March-1st April. You can check out the Festival of Power entry list by clicking here or by clicking on the John Woolfe Racing Event Coverage link on the left-hand side of any Eurodragster.com page. If you have any queries about Festival of Power entry then please get in touch with Ian on 01933 313625 (outside the UK +44 1933 313625) or E-Mail ir.marshall@btconnect.com. Geoff Stilwell asked us to say a big Happy 80th Birthday to his good friend and mentor Bob Muravez aka Floyd Lippencotte. Our pleasure Geoff, have a great day Bob. 8th March: Many thanks to József Hadnagy for forwarding us the official entry form and Supplementary Regulations for the FIM Europe Super Street Bike and FIM Europe Junior Drag Bike Cup rounds at Kunmadaras Raceway, Hungary on 29th April-1st May. You can download the entry form and supplementary regs by clicking here. "Kunmadár is awaiting you with an excellent track and a renewed drag arena! ", says József. Many thanks to Santa Pod Racers Club Secretary Ian Marshall for sending us Version 6 of the official entry list for the Festival of Power, which takes place at Santa Pod Raceway on 30th March-1st April. You can check out the Festival of Power entry list by clicking here or by clicking on the John Woolfe Racing Event Coverage link on the left-hand side of any Eurodragster.com page. Standard-rate entry closes tomorrow (Friday); entry after tomorrow, if accepted, may be subject to a Late Entry penalty. You can fill in and submit or download the official Festival of Power entry forms via the Information link of the SPRC web site at www.eurodragster.com/sprc. If you have any queries about Festival of Power entry then please get in touch with Ian on 01933 313625 (outside the UK +44 1933 313625) or E-Mail ir.marshall@btconnect.com. 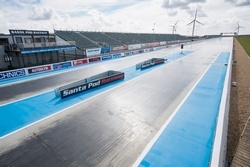 For the first time in its history, the Santa Pod drag strip has been completely rebuilt with concrete (previously asphalt) after digging up the original WW2 runway over winter. 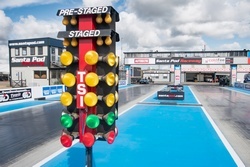 This marks the start of a new era for the Home of European drag racing. The legendary Harold Bull was the first man to record a time on the original race track way back in 1966 and here is your opportunity to etch your name in Santa Pod's illustrious history books. The Ebay auction comprises two lots and all proceeds will be split between the Air Ambulance Service (East Midlands) and Magpas Air Ambulance (East Anglia). One auction is for the chance to drive in the left hand Coldfire lane. There is a separate auction for the chance to drive in the right hand Autoglym lane. You will receive a certificate to mark the occasion. These first runs on the track will take place at the Run What You Brung event on Saturday 17th March. All you need is a valid driving licence (UK, European or International). After the first run you will also be entitled to unlimited runs that day and you'll receive a personal performance print-out showing your reaction times to the start lights, sixty foot time, eighth and quarter mile times and terminal speed. Visit www.rwyb.com for full rules and more information. As can be seen above work continues on the new strip at Santa Pod with the timing equipment being reinstalled ahead of fresh rubber being laid. You can check out a full gallery by clicking here. 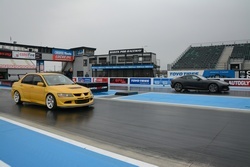 To see the new track in action at the upcoming Festival of Power, grab your tickets at www.santapod.com. 7th March: The latest spy picture to arrive at the offices of Eurodragster.com came with no words. If you would like to send your own spy picture, then drop us a line at eurodragster.com@btinternet.com. Further to yesterday's snippet the latest update from The Netherlands' Pro Dutch Racing Pro Modified team is now available in English as well as Dutch. Our good friend Remco Scheelings tells us that future updates will be available in both languages. Click here to check out the English-language update (PDF format). We would like to say a big Happy Birthday for today (Wednesday) to our good buddy, Honorary Eurodragster.com Staff Member, and imminently Pro Modified racer Spencer Tramm. Have a great day Spencer. Our good friend Jim Kelly's time travel thriller Found In Time is now available as an audiobook. Jim's forthcoming book about his racing experiences including working with Eurodragster.com sponsor VP Racing Fuels, which we are expecting to be a Match Race Madness for the 21st Century, is currently undergoing final editing and we understand that there may be enough material for a second volume. In the meantime you can find out more about Found In Time including purchasing options on Jim's web site by clicking here. Jon Webster is a name well known to Santa Pod having built and / or driven just about every type of race car conceivable and his reputation precedes him. 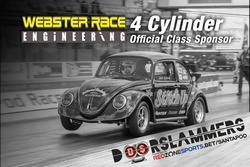 Webster Race Engineering are kindly putting their name to the 4 Cylinder class to put their engineering services in front of competitors and spectators alike. Jon said "It's a particular discipline we are interested in with several customers that could make an impact in the class. I was involved with the design and build of Wayne Saunders' World Record setting Ford Focus back in 1999 and the enthusiasm for the potential of the possible combinations out there has stayed with me. The Doorslammers is an excellent platform for these cars. Heads up competition is the real place for them to battle it out. We are currently involved with vehicles that may appear at the inaugural event and offer extensive workshop services and support with respect to race car construction and associated services and support." 6th March: Jonny Niesner of Drag Race Union says that the race is on to be part of this year's Pro ET Challenge but that entry closes on 25th March. "The prize money is fixed", says Jonny, "entry is in full swing, but the deadline is approaching. If you are interested in joining the Pro ET Challenge then you can find all the information you need at www.dragraceunion.eu/proet-challenge or on our Facebook page." Many thanks to Santa Pod Racers Club Secretary Ian Marshall for sending us Version 5 of the official entry list for the Festival of Power, which takes place at Santa Pod Raceway on 30th March-1st April. You can check out the Festival of Power entry list by clicking here or by clicking on the John Woolfe Racing Event Coverage link on the left-hand side of any Eurodragster.com page. Standard-rate entry closes this Friday (9th); entry after this date, if accepted, may be subject to a Late Entry penalty. You can fill in and submit or download the official Festival of Power entry forms via the Information link of the SPRC web site at www.eurodragster.com/sprc. The team felt honoured even to be nominated for this award, let alone be the fortunate recipient. I have been friends with Sag since I was fifteen years old and our history with Daddy Cool dates back at least twenty five years. Sag was always astonished at the progress we made with the car and never thought we would ever achieve the performance levels we did. A best of 8.84 and, more importantly to Sag, 150.26 mph as he was always a speed junkie on track. On the road he was the exact opposite. This award, together with the Don Garlits Spirit of Drag Racing award from the wonderful Wild Bunch, are everything Sag would ever have wished for. He was a great friend over the years, he was best man at my wedding, and his wonderful family are such special people to me so I know how much this will mean to them. With Sag I first went to Santa Pod a long time ago, we both loved the Page family and the great performances of Panic over the years, particularly the win in Pro Comp all those years ago so thank you so much to the Page family for the inspiration over the years. I have been privileged to be involved with this sport for so many years now and don't have any idea what life would be like without all these wonderful people involved in drag racing in every capacity. We hope to be racing Daddy Cool again this year with a family member driving the car, I think that is only fitting as a memorial. See you all at the track folks. "Good racing and everyone home safe" has to be the mantra. 6th March: The 'PDRC Nite of Champions', the 43rd Annual Pennine Drag Racing Club trophy presentation night and dinner dance, took place last Saturday 3rd March at the Campanile Hotel, Bradford. A donation from the BDRHOF Benevolent Fund was made to Yorkshire Air Ambulance Charity by Graham Beckwith, British Drag Racing Hall of Fame Selection Board Member, trustee of the BDRHOF Benevolent Fund and MC for the evening. Graham stood in for fellow trustee and BDRHoF Chairman Stu Bradbury, who was to have made the presentation, but was unable to travel from his Wellingborough home due to the weather. Receiving the cheque was Vickie Bowden, West Yorkshire Community Fundraiser for Yorkshire Air Ambulance Charity. 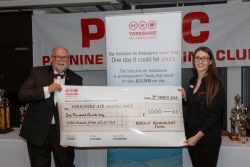 Vickie said 'Yorkshire Air Ambulance Charity is very grateful to the BDRHOF Benevolent Fund for their generous gift and for supporting the YAA, it really is appreciated'. For the BDRHOF Benevolent Fund, Graham Beckwith said ' The announcement of the presentation to YAA was well received and was applauded loudly and the rest of the evening went very well too. It is good to be able to make an award to organisations who provide services to the community as a whole as well as drag racing'. 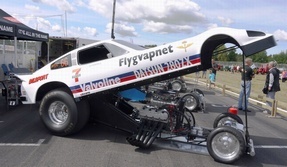 6th March: A new block and other bits and pieces, smart new T-Shirts, a pull at Eurodragster.com sponsor Dyno Unlimited and a tricky calendar dilemma all feature in the latest update from The Netherlands' Pro Dutch Racing Pro Modified team. Even if you don't read Dutch it is not too difficult to catch up by clicking here (PDF format). 4th March: The winners and runners-up in the 2017 APIRA Ultimate Power Championships and National Association of Supertwins were presented with their trophies at the APIRA Dinner Dance and Trophy Presentation in Warwick last night (Saturday). The winners of APIRA's Perpetual Awards, for whom Eurodragster.com readers had the chance to vote, were also presented with their trophies. Thanks to all of the Eurodragster.com readers who voted. Congratulations also to APIRA's Track and Safety crews who were presented with the Anya Yates Memorial Trophy. Darren Bullock was one of the most enthusiastic drag race fans you could ever meet. He was a controversial character but his love for the sport and knowledge for figures and times often amazed some of the European teams. I know he would have loved to have come back to the UK and seen the new track at Santa Pod. APIRA Trophy Night is Go. Please drive safely. Pre-Dinner Drinks will commence in the hotel bar at 6:00 pm followed by the evening meal served at 7:00 pm. Please can we have everyone seated by this time. Presentations will commence at 8:30 pm. We would appreciate it if background noise can be kept down during the presentations; it is only common courtesy both to the trophy winners and to hosts Angie Woods and Shaun Wilson. If you wish to hold conversations then please go to the bar. Due to high demand and late bookings it may not be possible to seat everyone with whom they wish. We have accommodated everyone as best we can to meet the hotel's deadline. We trust that everyone will understand, and thank you for the continued support. With over 190 guests coming the evening promises to be a memorable one! 1st March: Many thanks to Jennifer Faye of the SFI Foundation for forwarding us the final arrangements for next week's European SFI Recertification Tour. The inspection team will be Jennifer, Andy Robinson, Luke Robinson and L-G Eriksson. A list of items which can be inspected, now including SFI 61.1 turbochargers (Precision brand only), can be checked out by clicking here (PDF format). 1st March: Many thanks to Santa Pod Racers Club Secretary Ian Marshall for sending us Version 4 of the official entry list for the Festival of Power, which takes place at Santa Pod Raceway on 30th March-1st April. You can check out the Festival of Power entry list by clicking here or by clicking on the John Woolfe Racing Event Coverage link on the left-hand side of any Eurodragster.com page. You can download the official Festival of Power entry forms via the Information link of the SPRC web site at www.eurodragster.com/sprc. Diana Macrae asked us to say a big Happy Birthday with added hugs to fellow Podington Pea Kerry Jeyes. Our pleasure DD; have a lovely day Kerry and please accept additional hugs from the Eurodragster.com team. EBC Brakes back The Doorslammers. 1st March: Santa Pod Raceway are delighted to announce that EBC Brakes have been added to the ever growing list of partners for the Doorslammers event to be held on 19th-20th May. EBC Brakes are one of the biggest independent brake manufacturers in the world supplying pads and discs for all forms of motorsport. 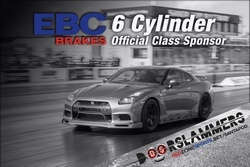 EBC Brakes, whose global headquarters are located close by to the track in Northampton, have signed up as sponsor for the 6 Cylinder Class which heralds a prize purse of £5000. EBC said “This year is shaping up to be an exciting season for our automotive teams who will be racing worldwide in a wide variety of classes, including drift racing, off-road rallying, Autocross, classic cup racing and much more! We're delighted to be involved with drag racing at Santa Pod this year and proud to sponsor the 6 Cylinder class at the Doorslammers."